It is Spring time, which for most people in the United States, means spring break, the melting of the snow, and the blooming of daffodils and tulips. For many at this time of year Passover and Easter are are the focus of not only religious renewal, but also family traditions. The tradition of wine with this time of year can be traced back to the last supper (during Passover) where Christ broke the bread, and drank the wine from the chalice, which later led to the Eucharist. Wine has a long history with religion. 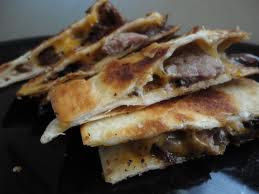 The traditional Passover meal (Seder) includes unleavened matzoh as a reminder of the haste with which the Israelites fled Egypt, leaving no time for dough to rise and zeroah, a roasted lamb shankbone. 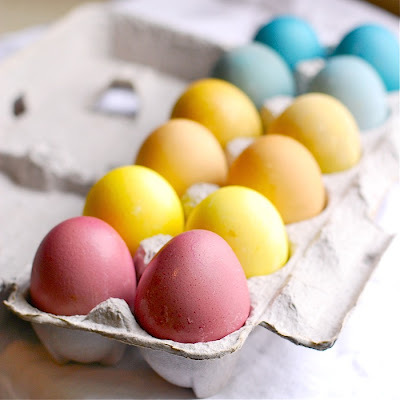 Easter traditions vary more widely, based on family heritage and history. Many families prefer to attend an Easter brunch after church services. These meals can vary widely in the choices, but some of the most common traditions include hot crossed buns, and hard boiled egg dishes. When it comes to dinners, the traditions seem a bit more focused. Two main courses have been garnering most of the attention in the United States: Roast lamb, and Honey-baked Ham. 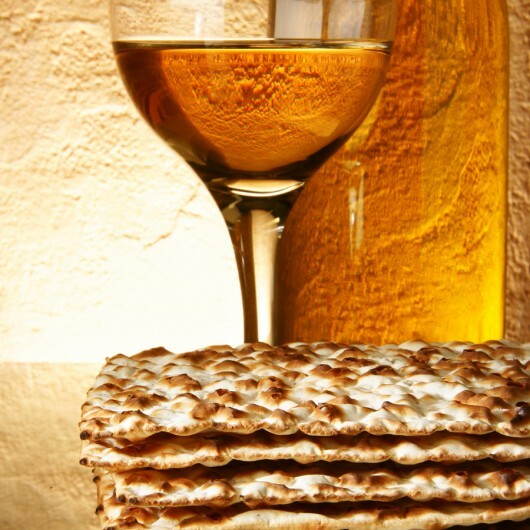 When it comes to wine pairings for Passover, the choice is much easier than for Easter. The Passover Seder calls for four glasses of wine, which are consumed during the service to represent the four-fold promise of redemption, with a special glass left for Elijah the prophet. The wine should be kosher, which will limit our choices. Since the main course is lamb, the focus should be on heavier red wines, such as Cabernet Sauvignon, and Syrah. These are classic pairings for lamb dishes, particularly roasted lamb. While I must admit, my tastings of kosher wines are somewhat limited, I can recommend s few that I have tried: Yarden (from Israel) makes a nice Cabernet Sauvignon, and tow California winemakers: Baron Herzog and Covenant are making both Cabernet Sauvignon and Syrah. Stay away from the Manischewitz, unless you like the taste of concord grapes in your wine glass. 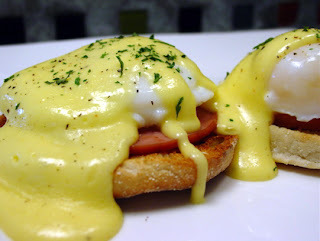 As mentioned, the Easter brunch offers the biggest options, and depends on what the focus is. Egg dishes present their own challenges, since egg yolk coats the mouth. With these types of dishes, we need a palate cleansing wine. Something higher in acid would be ideal, and even better would be a little bubble action to help scrub away the egg film. For this reason, sparkling wines are the ideal choice. Depending on the mix of items offered at brunch, you'll next need to decide if you want a fruitier, fuller wine (Blanc de Noirs) or something with a little more finesse (Blanc de blancs). An more versatile choice might even be a rose sparkling wine. The nice thing about sparkling wines, is that you don't have to break the bank, and purchase the best cuvée de prestige. There are some very nice, reasonably priced sparkling wines. If you can find it, one of the best values is Gruet (from New Mexico, of all places). Even the inexpensive (around $5) Schloss Biebrich Sekt from Trader Joe's is a decent entry level sparkler, and perfect if you are going to also make Mimosas. As for the Easter dinner, I have already mentioned some choices that work for lamb. The classic pairings are Cabernet Sauvignon, and Syrah. I tend to prefer a bit lower alcohol level with my wines, so I steer towards some of the cooler growing regions, where the grapes' sugar levels don't get so high. Ham offers a whole bunch of options, and depends on the style of ham you are serving. The classic honey-baked ham is on the sweeter side, so I would go with a dry Riesling. I prefer Alsatian Riesling from France, or German Spatslese with lower sugar levels (read my blog about German wines to help determine sweetness). If you are more of a red drinker, Look for Pinot Noir or even a village level Beaujolais (Gamay). A dry Rose would work nice too. Other types of ham open the door a little further. 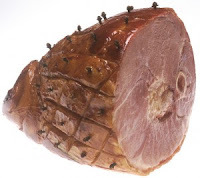 Clove studded ham adds some spice that might work nicely with a Gewurztraminer. Ham with pineapple should work well with Chardonnay. Again, if you prefer red wines, try a Rioja (Tempranillo) or even a fruity Zinfandel. And, as stated before, a dry Rose will satisfy both white and red drinkers. As with all holidays, enjoy your gatherings. Make them special with the proper pairings. And, remember the reason for the season. Happy Easter and Pesach same'ach. For the last wine tasting event with the Arrowhead Wine Enthusiasts, it was a bit more challenging. For the first time, we were meeting in a restaurant whose menu featured half Mexican food and the other half was steaks and seafood. We were limited on what types of appetizers would be available for the tasting. We had steamed clams, and mussels in garlic, along with chicken tenders, onion rings, and steak quesadillas. An odd mix, but I will tell you, all the attendees felt this was one of the best tastings we had done in a restaurant. The trick was finding the right wines to work with the odd mix of hors d'oeuvres. Food pairing is always a key component to a tasting! 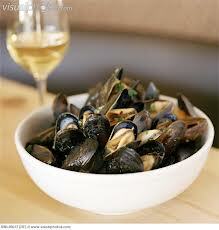 The steamed clams and mussels were the easiest to pair. I decided to go for a wine that most of the attendees were probably unfamiliar with, as well as one they would recognize (at least recognize the name, not necessarily the taste). For the first wine, we went with the Sauvion Muscadet Sevre-et-Maine Sur Lie Cardinal Richar. A long name for a wonderful white wine from the Nantes, in Loire France. The grape is Muscadet, or better known as Melon de Bourgogne. I'll write about this wine on my next blog. The second wine was Mer Soleil Silver un-oaked Chardonnay from the Santa Lucia Highlands in Monterey California. While everyone is familiar with Chardonnay, they may not know what an un-manipulated Chardonnay tastes like. This crisp, clean Chardonnay was a nice pairing for the seafood, and went surprisingly well with onion rings, and the guacamole. For the third wine, I took a risk. I have found that most people are still reluctant to try Rose, thinking they are sweet. But what better wine is there for a transition from white to red, and that can work with all types of foods? While I am a big fan of certain California Roses (those that follow this blog will know my favorites), I decided to go with a French wine from Provence. I chose the Domaine Fontanyl Rose de Provence. Very dry, with a somewhat bitter finish, but nice amounts of strawberry, cherry and watermelon on the palate. The transition into reds was the toughest wine to choose. The challenge with Mexican food is usually the heat, and high alcohol levels can accentuate the heat. I wanted something fruity, but wanted dark red fruit. I focused in on Zinfandel (a notoriously high alcohol wine, due to high natural sugar content). The California Sierra Foothills produce some nice jammy zinfandels. 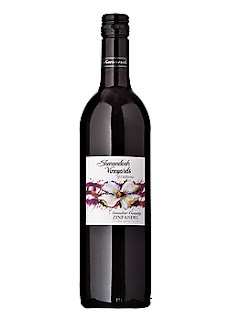 So, I looked for a low alcohol wine, and found it in the Shenandoah Special Reserve Zinfandel. There was just a little bit of Petit Sirah added, making this a fruity wine, with nice acidity, soft tannins, and just the right balance...making it a prefect pairing for the steak quesadillas. For the last wine of the evening, I went "heavy". I chose a wine from the Duoro region of Portugal. What is the best known wine of Portugal? Port! The Quinta Do Vale Meao Meandro is made from the same grapes as your dessert Port (Touriga Nacional, Touriga Franca, Tinta Roriz, Sousão, Tinta Barroca, and Tinto Cão), except it is not fortified, so is not sweet. The wine is deep red, full, dry and fruity, but had nice balance for a big wine. In hindsight, this wine could use some air, and I would have decanted it, or opened it up well ahead of time. Hopefully these five wines will give you some ideas on what you can do, and encourage you to explore some wines that you wouldn't normally try. 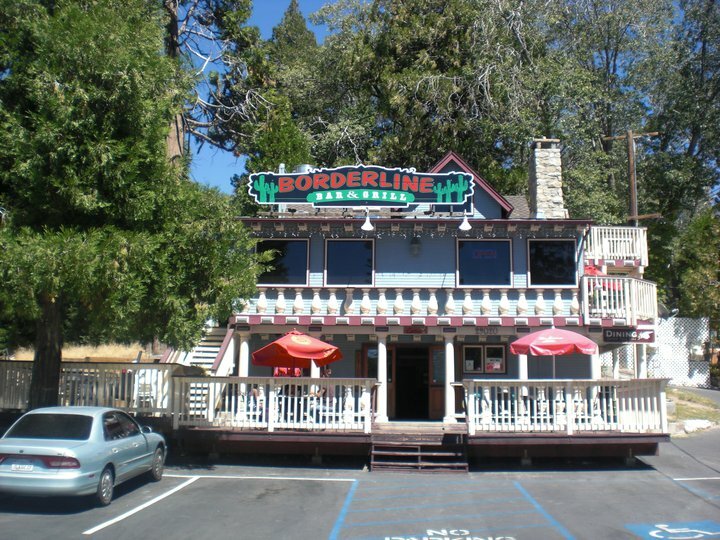 Oh, and that restaurant....if you are in the Lake Arrowhead area...check out the new Borderline Restaurant in Cedar Glen. 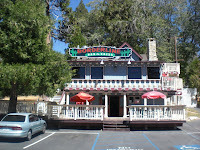 Located in an old bordello, you might just be surprised my what Ricky is offering on the menu. Last weekend, I had the opportunity to attend one of the largest wine tasting events in Southern California, The Family Winemakers of California event in Del Mar. There were 159 wineries in attendance and only five hours to get to as many as I could. The following is my recap of the event, and some of the wine "gems" I was able to find (and wines you should try). Prior to the event, I had received a list of all the wineries that would be in attendance. I spent quite a few hours researching each winery on the list, learning about them, their wines, their approach, and their location. As you can imagine, many of these are small wineries, that most of us haven't heard of. Then again, there were the large (well-known) wineries too, like Grgich Hills, Rutherford Grove, Merry Edwards. I next took a map of the tasting venue, and highlighted all the wineries I wanted to visit. I included some of the larger wineries, only to see if people like Mike Grgich or Merry Edwards were there, in an effort to meet them...no such luck. The bulk of my focus was on Central Coast wineries, plus Sonoma, Napa or Sierra Foothills wineries that were producing wines that had generated some "buzz" in the industry. My Central Coast focus was more personal, as this is an area that I consider myself to be well versed in as far as geography, geology, climate and people. As the 1:00pm start time approached, we walked to the Del Mar fairgrounds. Our anxiety rose a bit, when we encountered a long line beginning in the parking lot. Luckily for us, this was the line to the neighboring gun show. (Nothing like guns and alcohol at the same venue!) As it turned out, there were only about 20 people in line when we got there, but the line grew quickly, and the event opened on time. We picked up our commemorative wine glass, along with the red Solo spit cup, and headed out to meet a few winemakers. Our first stop was to catch up with some winemaker friends we haven't seen in a while, so Dragonette Cellars (Brandon Sparks-Gillis) and Ampelos Cellars (Rebecca Work) were the first tastes of the day. I have known these winemakers for a long time, and have always enjoyed their wines. This day was no exception. The new Dragonnette Pinot Noir Fiddlestix vineyard was outstanding, and no one in California can touch their Sauvignon Blanc or Rose. Ampelos Cellars continues to make great biodynamically produced Pinot Noir, and their new cool climate Grenache ('08) was very good. Also said "hi" to friends at Cass Winery, Chateau Margene, and Niner Estates. Barr Estate Albarino - great to see Signe Zoller as the winemaker. I've been a fan of her wines going back to the Kendall Jackson, Meridian, and Zoller Wine Styling days. JC Cellars - an outstanding 2008 Musci Vineyard Syrah from the Alexander Valley. Deep, dark black fruit and well balanced. Seavey Vineyard - the best Cabernet Sauvignon of the day - 2009 Caravina. Powerful, rich, with a long finish. While it is drinkable now, I'd hold on to it for another 5 to 7 years. Sycamore Cellars - Probably the friendliest people at the tasting. I look forward to visiting their winery in the south end of the Santa Lucia Highlands in Monterey. I did enjoy their 2010 Pinot Noir, and the dark, teeth staining 2010 Petit Sirah. Pomar Junction - there were a number of wineries serving dessert wines. I only made it to a few of them. Of the ones I tried, the Pomar Junction 2010 Late Harvest Viognier stood out. I had a nice conversation with winemaker, Jim Shumate. This Viognier was affected by noble rot...very unusual for the Paso Robles area. Burbank Ranch - had a nice talk with all the family members. They make a nice Cabernet Sauvignon, but what you should know is that they sell grapes, so you home winemakers, this might be a good source to check out. After about three hours, my palate was getting a bit fatigued. A handful of crackers and a glass of water would have done the trick, but I soon found out that the crackers I grabbed were black-pepper crackers, and my mouth was soon on fire. There were plenty of tables with cheese and crackers placed throughout the venue. The Sadie Rose Baking company had a number of different breads for tasting (check out their pretzel bread). In five hours, I was able to visit 27 wineries. My best guess is that I tasted anywhere from 130 to 150 wines. The spit cups and buckets do come in handy. I probably swallowed only about one glass of wine. Seems like a waste, but when you are tasting, it is critical. There are a lot of fine wineries I have left off this recap, and many I didn't even get a chance to taste....if only, I had the time to stay around for the Sunday tasting too...oh well, there is always next year!